Unknown Face (Unbekanntes Gesicht, 2013) is an installation / action that first took place during the festival Transitio_MX05 in Mexico City in September 2013. On June 18th, 2012 Facebook bought the company Face.com, developer of a powerful technology for face detection and recognition, which could identify not only the gender and emotional state of the person facing the camera, but also would compair it to a large database from which it could be later recognized in any captured photo or video. Complementing the free API (no longer available) with Facebook, Face.com had recognized and tagged, by February 2011, 18 billion faces. After buying Face.com, Facebook has the world's largest people's face, location, job, education, gender, type of relationships, etc, etc ... database. The concern of this project is mainly how easily us, users of Facebook, have given away our virtual identity, which everyday increasingly, also affects our real identity. 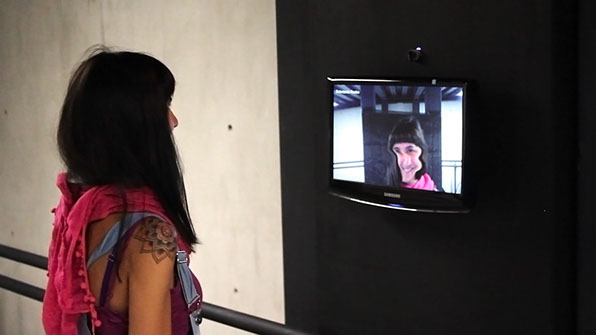 In Unknown Face the camera detects the faces of visitors and censors them immediately. The "stolen" faces are compared to a database extracted from the Facebook profiles that gave a "like" to Transitio Mx's page and had a public image in their profile where their front face would appear. The extracted data is used to create new Facebook profiles with information from people who look alike to the visitors of the artwork, together with the new detected face when entering the gallery. Doing this, Facebook is populated with "white noise", garbage data that are only part true, but have traceable features from multiple profiles. This way, addressed virtual identities become blurred and therefore less traceable. 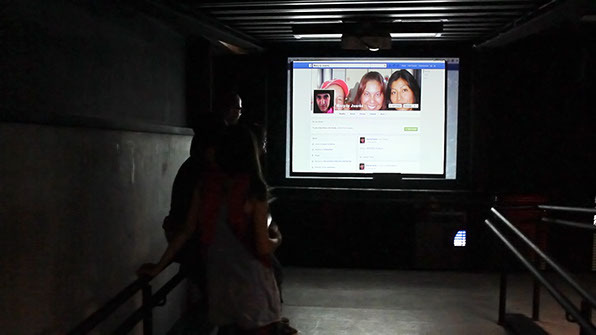 New profiles are projected in another part of the gallery, so people will recognize themselves and their new fake identity. This installation-action aims for a reflection about the total loss of control and anonymity of identity, which has been transformed from the existence of social networks, particularly Facebook.